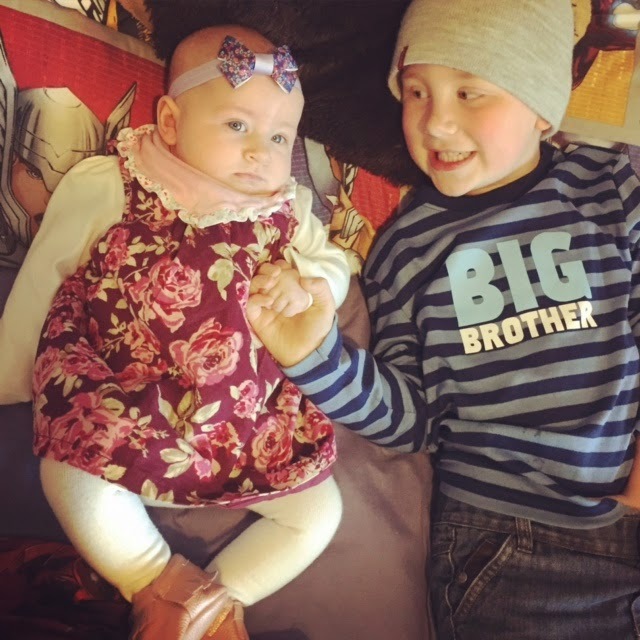 Logan absolutely loves being a big brother to his little sister Harlow and although she's only been here for 17 weeks there's not a day goes by where he doesn't want to talk or interact with her. Like I've said before the other half and I weren't sure how he would take to big brotherhood since it's a massive change to have another little person sharing your Mummy and Daddy. 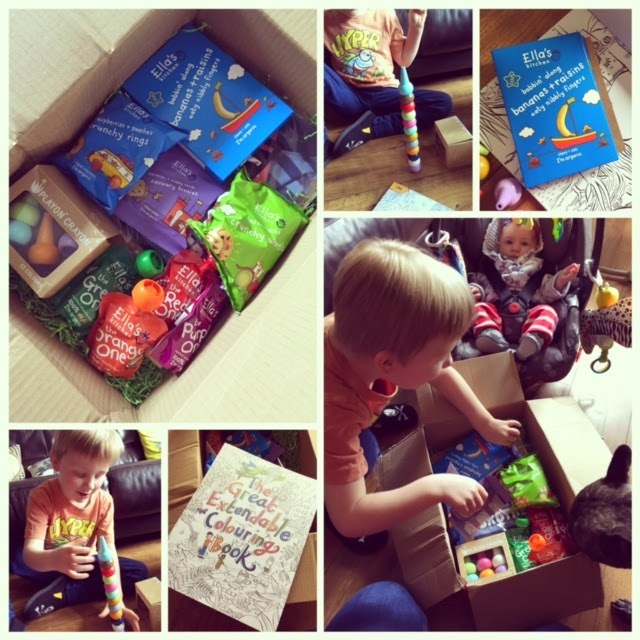 We've definitely struck it lucky though, for now anyway, so to celebrate him in all his big brother glory (just like Prince George and his baby sister, Princess Charlotte) the lovely people from Ella's Kitchen sent Logan a big box of goodies. Logan loves a surprise present and was thrilled when I showed him the big red box with his name on it. We opened it together and I was pleasantly surprised to see lots of fab goodies for him to enjoy. He wasted no time in getting stuck in anyway and true to form invited Harlow down on the floor to have a play with him. Of course she just watched but was absolutely fascinated at what her big brother was doing. Even the dogs had to have a look! 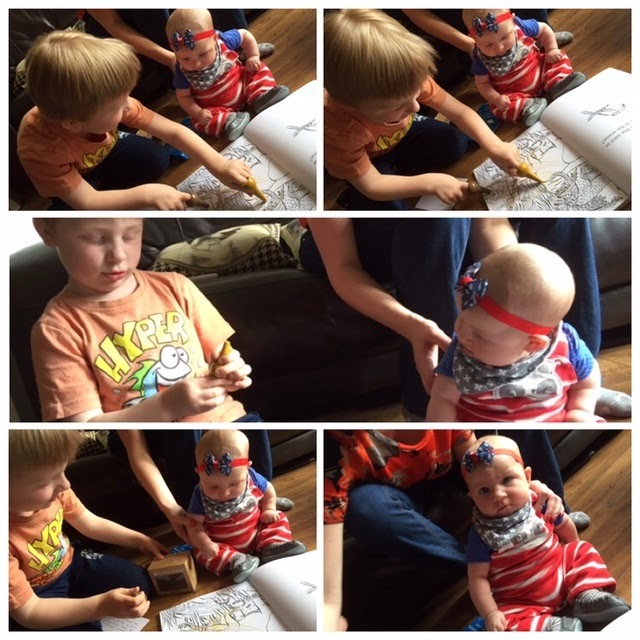 Some of the lovely items in the box included an amazing colouring book (The Great Extendable Colouring Book), a set of very cool crayons (Playon Crayon), a big brother top to wear, a certificate to say how awesome a big brother he is and also a ton of Ella's Kitchen snacks. Some of the tasty snacks in the box were; cheese + leeks crunchy wheels, raspberries + peaches crunchy rings, bananas + raisins oaty nibbly fingers, the green one smoothie, the orange one smoothie, the red one smoothie and parsnips + poppy seeds savoury biccies. Logan hasn't eaten all of his scrummy nibbles yet but his favs so far have to be the smoothie pouches. They're delicious and perfect for him to take to school as a healthy snack as well so I might have to stock up. 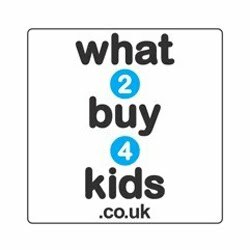 You can check out Ella's Kitchen shop and products here. I was sent the Ella's Kitchen box of goodies in return for Logan showing what it's like to be a big brother. All words and opinions are my own. 0 comments on "Celebrating Siblings - Being A Big Brother"